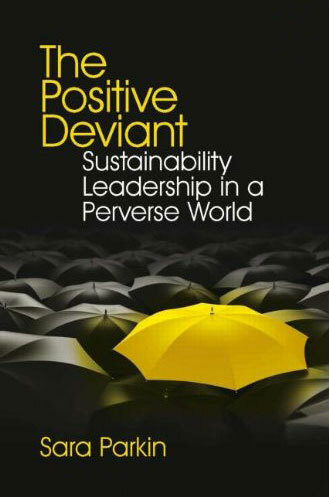 The Positive Deviant: Sustainability Leadership in a Perverse World was first published in 2010. It is based on the course I designed and taught for at Forum for the Future for 20 years, and has since become a core text for multiple other university courses in several countries. Following the thinking of The Positive Deviant, I have drawn many of the arguments for my newest book What Does Good Look Like? which you can find, and even contribute to, here. Please see the abstracts below for an insight into The Positive Deviant, or alternatively, you can order your own copy here. A Positive Deviant (PD) is someone who does the right thing for sustainability, despite being surrounded by the wrong institutions, the wrong processes and thoroughly uncooperative people. Once a rare brave creature, now a growing band of PDs are creating a brilliant good news story. They are demonstrating to today’s panicking leaders that interconnected financial, ecological and social problems can have a happy resolution, if some basic sustainability principles are taken seriously. This website is about how you can become a PD too (or polish your credentials!) wherever you are and whatever you do. A couple of years ago I wrote a sort of DIY guide – The Positive Deviant: Sustainability Leadership in a perverse world. It will get you started. Here you will find some extracts, but mostly this is about put its messages into practice. All to build confidence (mine as well as yours!) that it is entirely possible to decide and act in a way that is are more likely than not to take us in a sustainable direction. The odd title of this book was born of much frustration and not a little anger. For over 40 years I have campaigned for a great awakening from the fantasy that the natural world’s capacity to support unconstrained demand from us humans is infinite. ‘Think of your grandchildren’, we used to argue, ‘think of your children’. Now the cost of those decades of inaction means worrying about future generations has been overtaken by worries about this one. University leavers, where most of tomorrow’s leaders are being prepared, can expect over 60 years of healthy active life. Most people admit something must be done – and quickly. But what and how remains unclear. Coming out of a senior management masterclass on sustainability, one participant complained: ‘But I still don’t know what to do differently on Monday!’ She is not alone. If survey after survey is to be believed, many people are ready to get cracking on finding more sustainable ways of living and working, but don’t feel confident they know the right way to go about it. What they learnt at school or college has simply not equipped them with the right knowledge or skills. Missing too are unambiguous leadership signals from government or workplace. UK cabinet members, like the boards of most firms large and small, are split on whether climate change is (a) happening; (b) urgent; and (c) their responsibility anyway. Bewitched by the pond-skaters of public opinion – the pollsters, focus groups and the twittering media – leadership everywhere seems to have lost its macro- political compass. The poor preparation and chaotic process at the 2009 Copenhagen UN Climate Change Summit epitomized what is wrong with global leadership. As does the weak ambition of the Millennium Development Goals (MDGs) where halving global poverty by 2015 is deemed to be a legitimate target, and all goals are imperilled by the perversity of a global economic system that is dependent on overdosing on resources and under performing on basic human rights. Hence the title of this book. We have left it so late to put our human house in order, that the only strategy left is that of positive deviance. We can’t wait for the international treaties, institutional reform or wise government leadership that will be too long coming. The only option is for as many people as possible to get on and do the right thing – wherever we are. It is a very positive revolution: against everything that leads back to behaviours that caused the ecological (and economic) breakdown in the first place, and for a stampede towards a future that puts improving the quality of life for people and the environment as the primary purpose of everything we do. In a Robin Hood sort of way, I’m inviting you to join the growing and merry band of positive deviants committed to doing the right thing, despite everything and everyone, and recruiting like mad as we go. A sense of urgency and passion about sustainability are the only joining qualifications. But what about that Monday question? How do we work out what are the right things to do? There are next to no courses and no single book to help you get going quickly. You are likely to have some ideas and knowledge already, but perhaps do not yet feel sufficiently confi- dent in your decision making. This book aims to fill the gaps – in your confidence as well as in the marketplace for such books. An early warning though – it will not tell you what to do. My purpose is to stimulate you and help you build or refresh your own leadership ‘persona’ so you are confidently sustainability-literate and effective as a positive deviant. In my experience one size rarely fits all, particularly when it comes to leadership. To be authentic, and therefore trusted and worthy of being followed, you have to be true to yourself. Your personal sustainability leadership model is therefore as unique as a snowflake, and in the case of an organization, as singular as its logo. With this book as your companion you should find all you need to work out how to identify the right thing to do, in whatever circumstances you find your- self. Plus some tools so you can get started straight away. To be authentic, and therefore trusted and worthy of being followed, you have to be true to yourself. Your personal sustainability leadership model is therefore as unique as a snowflake, and in the case of an organization, as singular as its logo. With this book as your companion you should find all you need to work out how to identify the right thing to do, in whatever circumstances you find your- self. Plus some tools so you can get started straight away. As sustainability leadership may be exercised from everywhere in an organization, this book will be relevant to people in very different sorts of jobs. And I hope it will provoke a revolution too in those places where management and leadership development takes place. In fact, I hope it has a broader influence on education in general. If I had my way no one would leave any publically funded educational institution who isn’t sustainability-literate. Ideally, it will become one of the things good parents, teachers and friends inculcate in children from the earliest age so they become responsible and happy adults capable of bringing up the following generation in much the same way. As a one-time nurse, I know only too well that a successful treatment depends on a good diagnosis. Treating someone for a stomach ulcer when they are suffering from a heart attack, for example, may even make things worse. The best diagnosticians know enough about the body’s anatomy and physiology (how everything works) to quickly appraise the symptoms, make a good diagnosis and get on with the treatment. Exactly the same principles apply when it comes to diagnosing and treating unsustainable development. Indeed, James Lovelock describes himself as a ‘general practitioner of planetary medicine’. This is not a bad metaphor for positive deviants to adopt, though it is well to remember St Luke’s injunction that first the physician has to heal himself. In Chapter 1, therefore, I try to give you a good enough overview of the various symptoms of unsustainable development, enough for anyone unfamiliar with them to be able to explain them to others. I draw parallels with the human body, so, for example, biological resource depletion represents a wasting of the flesh and scarring of the skin of the Earth. Like the human body, the anatomy of the Earth operates according to certain principles, which I have called ‘laws’. Chapter 2 starts by looking at how we have broken, and are still breaking, these laws. For a long time I would have said we did this out of ignorance or for want of reflection, but now there is a strong element of wilfulness as the consequences become more obvious. Which is why one symptom – a heart attack in the human economic system – is presented as a whole system or physiological failure. A diagnosis is made. The treatment proposed in Chapter 3 is not so much a detailed prescription, but a consideration of the sort of treatment that will be needed to get the patient (i.e. ALOE+US) back on its feet. The idea is to help you differentiate between good and bad planetary medicine, and perhaps concoct a few remedies of your own. Subsequent chapters are about leadership, and how to grow your capacity to offer sustainability-literate leadership in such critical times, becoming an effective planetary physician yourself. But this section is about why it matters, and why positive deviants have such an important role to play in what happens next. Leadership is a vital ingredient for achieving sustainability. Without it, sustainability will never make it – in government, business or anywhere. In and out of organizations, what everyone does at every level matters enormously, of course. Widespread, often localized, innovation in how to live and work in low-carbon/high-happiness ways is where sustainability will be put into operation and made real, but only leader- ship will give sufficient direction, scale and pace to what works well. There is plenty of historical evidence that one without the other will not be sufficient. My hunch is that many readers of this book will have been on some sort of management training course, and that, to varying degrees, it will have been useful in some way. Teasing out what is relevant for a sustainability-literate positive deviant is explored in Chapter 4, via some of the ‘theories’ from which leadership ‘thinkers’ have tried to distil practical models. I won’t say this has been easy, nor that great enlightening conclusions are possible. Not least because there is an impossibly vast, frustratingly contradictory number of books and journals on the subject. The British Library has ‘something in excess of 50,000 books … of which about 80 per cent have been published during the last 20 years’ while the Library of Congress admits to ‘at least 30,000 titles on the subjects of Business Management and Leadership’. Unlike purveyors of snake oil with one remedy for multiple malaises, it seems management training has many complex remedies for one comparatively straightforward problem. The very large number of courses, in and out of universities and at all levels, have no common view on essential components. It seems that by and large teachers teach what takes their fancy, and, until very recently in both the US and the UK, public sector leadership theory seems to have followed slavishly the private sector model. Nevertheless, with persistence, it is possible see through the fog of fashion surrounding leadership education to identify some useful insights – the babies we want to nurture and grow in a new vision for sustainability-literate leadership. There are two chapters in this section. The first concentrates on the various theories around management (mostly) and leadership and uses two reflections – on women and on power – to help illuminate some of the deepest problems in the practise of leadership today. The second gives a twist of the lens to focus on business schools, where most management and leadership development takes place, and suggests they have been detrimentally influenced by ideologies and corporate interests. I also argue that that the advent of ‘corporate social responsibility’ may well have slowed rather than accelerated the passage of firms to genuinely sustainable practices. Whether you agree with me about any of this or not, readers should find in these two chapters sufficient stimulus for reflecting on their own education and experience to date. Deconstructing what you know into a sustainability-sensitive mindset is the first step to analysing what you need to add as you develop your own sustainability-literate leadership ‘persona’. The ‘wiring’ diagram on page 92 (not shown here) should help you keep some shape to your learning journey, which, ideally, will be a lifelong commitment to always trying to do better, and to do more. To be most effective most quickly you need keep four wheels turning simultaneously: your self- knowledge and broad general knowledge; how views about how the world works shape what people believe and do; the quality of your relationships with others; and various tools to sustain your personal learning and to improve the capacity of sustainability-literate action in others. Ultimately, your learning should translate into your own distinct leadership model or ‘persona’ which guides your behaviour and the actions you take. Previous sections provide the reasons for shifting to a more sustainable way of life and try to harvest some key lessons from existing leadership education. The section following this will give you some headlines about global solutions to unsustainability, to demonstrate the true scale of the effort needed, but also so you can see where your more local efforts and that of the people you influence are contributing. This section sticks with the thesis set out in the Introduction to the book – that there is no one model for sustainability-literate leadership for an individual or an organization (which is a collection of often very different individuals anyway). Here, therefore, we major on areas of thinking, learning and practice that will help you build your own, unique, brand of sustainability-literate leadership. A successful positive deviant can only persuade others to trust and believe in them if you are speaking from the heart, in your own way. Quoting and cribbing from others is fine – indeed essential – but won’t be believable if it is parroted without reflection. In truth, there are many blurred edges between different parts of this section, but I’ve tried to organize and write so the ideas will be accessible to someone tangling with leadership and/or sustainability for the first time, yet also offer the more experienced some new angles and insights. I’ve tried to minimize (though not eliminate) the amount of jumping backwards and forwards, and to offer all types of reader a variety of trails of interest to follow through the references. Each item is prefaced with a learning outcome (what you should expect to be able to do if you are sufficiently up to speed on each component) to help you quiz yourself on your progress. The exceptions is the Four Habits of Thought, which start with questions you should be asking yourself all the time, ideally automatically, to keep your immediate decisions firmly in a longer-term and broader sustainability context. Although my focus is the individual learner, if you are responsible for delivering leadership and management education or training that might be classed sustainability-light, I hope this section will help you transform your courses. If you are in a business school and looking for redemption for past sins of commission or omission, there is only one place to go – sustainability-literacy! By moving it from the wilderness of an optional module and mainstreaming into in all your courses, you can help bring battalions of allies in behind the positive deviants already out there in the field. If this section had a slogan, it would pinch that of the supermarket Tesco: ‘Every little helps’. Its purpose is to help you handle the argument that unsustainable development is globally so advanced that local contributions are pointless.Compared to the US or China, the UK’s emissions are tiny, so why bother when the big countries don’t? What difference will it make if I turn off the lights or you use a bicycle when those around us don’t? Both practically and morally, the answer to both those questions is: a lot. If unsustainable development is the outcome of zillions of (mostly) unknowingly wrong decisions and actions then the route to sustainability will be paved by a similar magnitude of knowingly right decisions and actions. Even a miraculous edict or wholesale policy change from top levels of leadership in an organization, country or even an international body, while greatly to be desired, will only become reality through a multiplicity of relatively small and mostly local acts of implementation. Many of these will have to be in positive deviance mode, because there won’t be time to wait for top-down institutional reform before we get on with it. The challenge for the implementation brigade – the sustainability-literate positive deviants and those they motivate – is to maintain confidence over time that they are actually making a global contribution of value in what are bound to be turbulent times. Tesco is well aware that a penny off this or that item in the weekly shopping trolley may not seem much, but actually adds up to a noticeable saving. In just the same way every contribution to a more sustainable way of doing things, however small, adds up. The talk of tipping points in relation to CO2 emissions triggering runaway climate change, needs to be countered by the positive message of tipping points in the other direction – from multitudes of actions that bring emissions down. Moreover, opting out or preaching hopelessness sends the wrong message both ecologically and philosophically. If I don’t, or you won’t, then why should anyone else? A negative psychological loop is created. But if I do and you do, then together we can create a positive loop that is attractive to others. Being in a positive club not only does good, it feels good too. The previous section considered many ways for you to develop your own capacity to provide sustainability-literate leadership, so you are able to decide and act in favour of sustainability, regardless of the perversities of the world around you. This section should help you to tell a good story about what a sustainable world might look like and describe the grand lines that will get us there. Like the Five Capitals Tool, it should help you see and talk about the interconnections between different elements of sustainability, but most of all it should help you connect, for yourself and others, the way local efforts can contribute to global outcomes. There is just one chapter – Chapter 9 – which starts with the list and a short explanation about how it came about. For those interested in the longer story behind the way the list is constructed, that comes at the end. Returning to the metaphor of Chapter 1, the Global Sustainability To Do List could be seen as the fitness regime the patient ALOE+US needs to complete in order to return to full health – assuming, that is, we have learnt our lesson, taken our medicine and stopped gorging on an unreformed and resource and soul-depleting human economic system. Prologues normally come at the beginning not the end of a book. This one, however, is designed to come at the start of your career as a sustainability-literate leader who is wise to, and increasingly confident in, the arts of positive deviance. Not as an epilogue to what has come before, but as a prologue to the rest of your life. By now, I hope, you will understand sufficiently your own role in these spectacularly challenging times, and will be ready to heed the message that it is leadership that changes the game. Nothing is preordained. Good leadership can decrease the severity of negative developments and increase the likelihood of positive ones. You will be brave in letting governments and organizations know what you expect from them, and no less ambitious for yourself and your neighbours. Your powers of persuasion, imagination and example will mobilize ever more recruits to the cause of sustainability. What you do from now on could not matter more. The other reason for making now – the moment you arrive at the end of this book – the point where the future really starts, is because we have been here before. Coincident with the first Earth Summit in 1972, a team from the Massachusetts Institute of Technology (MIT) published a book, Limits to Growth (LtG) (Meadows et al, 1972). Using newly developed ‘systems dynamic’ computer modelling they, for the first time, linked the world economy with the environment and ran a series of scenarios, including a business-as-usual one, called the ‘standard run’. This scenario predicted ‘overshoot and collapse’ of populations and economic systems sometime in the 21st century unless there were early changes in behaviour, policy and technology. Immediately, the authors were subject to sustained false claims and criticisms, as Rachel Carson was ten years earlier when she published Silent Spring. The biggest lie, still repeated, is that LtG predicted collapse during the 20th century and as this didn’t come to pass the whole thesis was thus discredited. So, here we are again, nearly 40 years later, after yet another big and unsatisfactory conference (on climate change, in Copenhagen) and with a redoubling of the efforts of the deniers, naysayers and those who work cynically to subvert any attempt to change the business-as-usual scenario – just as they did in 1972 and at every twist and turn since. Early in 2010, Nature magazine warned climate scientists that attacks on them are only superficially about the science, and that they ‘must acknowledge they are in a street fight’.5 So, what will be different this time? Quite a lot, I would say. The perversity of the way we run our affairs and the corruption or carelessness of too many people in leadership roles may not melt away as quickly as you and I might wish, but never before has the failure of current leadership models and priorities been so visible. Their negative effects on people and the environment, and their dependence on bad governance practice, have exposed the nakedness of the business-as-usual Emperor. That Nature editorial would not have been written even five years ago. Consequently, as we square up to a fiendishly difficult couple of decades that will determine whether the 21st century is a human triumph or a tragedy, there is a search on for a new logic in which to make sense of what to do next. For me, and I hope by now for you, the only logic that seems to fit the bill is sustainability, where growing environmental and human and social capital in pursuit of a good life well lived becomes the purpose of the ‘toil and bustle’ of our lives. In that logic there is what Susan Neiman calls a philosophical basis for understanding the difference between the actual and the possible, and a framework for getting there6. A cautionary word. We will have to mobilize all our leadership skills to defend this new logic. ‘It’s unrealistic’ will be the most common objection you will hear. But don’t fall for it. Calls for reality are calls to lower your expectations. The counter question has to be: ‘Where will your reality take us, what logic is it pursuing?’ Arguing for sustainability means that, if we want the ideal, we will have to strain very hard for it. Aim high and we might get most of it, if not all. And even if we do fall short, that is likely to be good enough. Aim low and we are bound to fail. Being asked to accept the realpolitik means bowing to someone else’s reality. Part of championing sustainability will mean differentiating it from an ideology. That is a bounded collection of ideas, like Thatcherism or socialism, which, if applied to a given situation, is expected to come up with a recognizable solution or policy. As we are surrounded by the failure of the ideological approach to governing and to solving the very ‘wicked’ (complexly interrelated) problems we face, why develop another one? Gillian Tett remarked that it is the finance world’s lack of interest in wider social matters that goes to the very heart of what went wrong7. No, sustainability is not a hard edged ‘ism’. Nor, though it is a new way of thinking about the world around us and our place in it in a spiritual as well as a practical sense, is it a religion. Sustainability is more like a moral obligation, something that can take each of us in a different way even though we may be joined by a commitment to a similar end. Because we are all starting from a different place, there are many paths to sustainability. Anyone can join in without taking an oath or paying a membership fee. Susan Neiman also argues that morality is not God-given, and that is not even discernable in the rest of nature. It is human made. If the world is not what it should be, it is up to us to open our eyes and close the gap between what is, and what ought to be. If we want moral clarity, she says, we have to put it there. We have to do the living in truth. We have to do the right thing. No one can do it for us. Our ideas and words must be powerful, of course, but in the end it will be our actions that are convincing. For me, that sounds like a good enough creed for sustainability-bound positive deviants! The purpose of this book is to help you feel the same. I’ve tried to expose you to a deeper and broader way of thinking about sustainability, as well as to the excitement around the new ideas for making it happen, in a way that is interesting and sometimes provocative. I hope I leave you stirred and confident enough to set out on your own sustainability leadership journey, starting on Monday. Even though our various paths mean we may never actually meet, I nevertheless look forward to working with you from now on. In Chapter 9 of The Positive Deviant I draw on a number of models for thinking about what has to be done if sustainable development is to become a reality. Nearly 15% of our way through the 21st century we are still shrinking natural, human and social capital. So when I talk about growing it instead, what sort of magnitude of change is implied over what time period? When I say we need fewer people consuming less stuff – how few and how much less stuff? Conflating the best of some of the models (and without any claim to any degree of certainty) I have crafted some possible answers to these questions. Because, as we wrestle with the day-to-day, it is really helpful to keep in mind roughly where we want to end up. How else to check if our direction of travel is good enough if we don’t have the foggiest idea of where the destination lies? Therefore over the next few page appears the summary To Do List from The Positive Deviant. It has goals for 2050, each of which are discussed at more length in the chapter. Where appropriate posts will be linked to the relevant page in the To Do List as well as tagged. This should enable you to move between pages, tags and blogs and see where your contribution fits not only locally, but globally too. At least double the area of the earth under sustainability conservation measures particularly for freshwater, marine and especially vulnerable and neglected land areas. Shrink land take for human infrastructure (built environment and agriculture). In this fascinating book, Sara Parkin condenses her years of teaching experience into the definitive ‘how to’ guide to sustainability leadership Tim Jackson, Professor of Sustainable Development Surrey University.